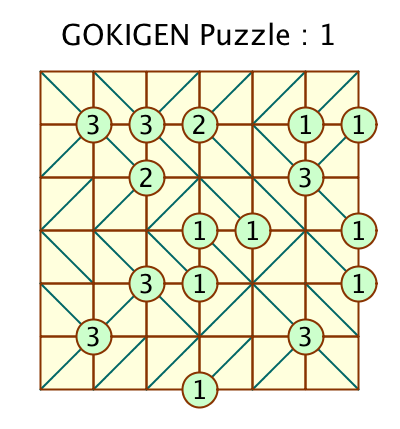 A GOKIGEN puzzle consists of a square or rectangular grid. Every cell in the grid must have a diagonal line inserted. The numbers at the corners of some of the cells indicates the number of diagonals which converge on that point. The diagonal lines must not form a loop of any size. Each puzzle has a unique solution which can be found without guessing. 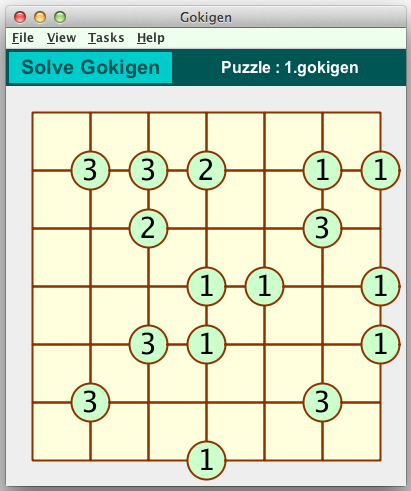 The following graphics show a Gokigen puzzle in the Crossword Express Solve screen and a PNG graphic file produced by the program's print function, showing the complete puzzle solution. See also a full size version of a PDF file showing the solution.